On Saturday the 15th of November De Courcey Classic and Vintage Club held a presentation night to distribute funds raised at the 2014 Harvest Working day on the farm of Jim and Eileen O’Regan at Coolyrahilly, Barrel’s Cross, Kinsale in County Cork. 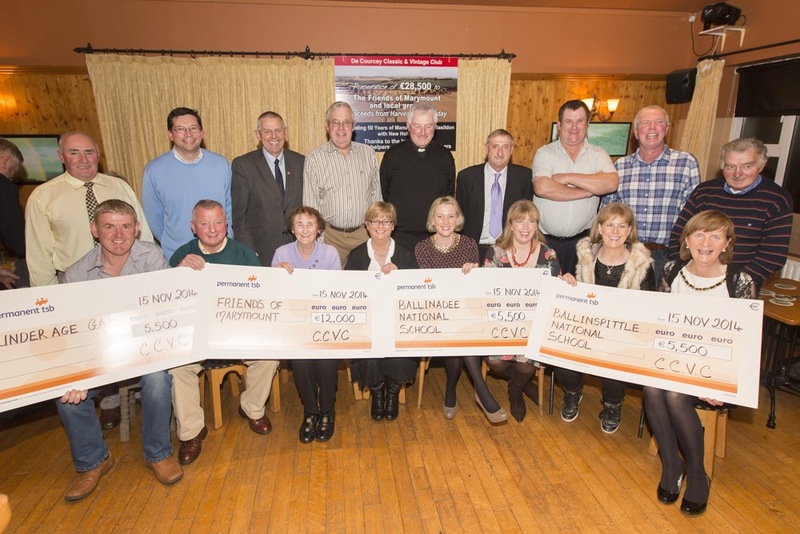 This year the Club had €28,500 to distribute to various groups. The main beneficiary were The Friends of Marymount Hospice who received €12,000. Ballinadee and Ballinspittle National Schools both received €5,500 and Courcey Rovers underage GAA teams received €5,500. This will bring the total amount donated by the club in the last five years to over €67,000. The many thousands who attended the Harvest event on the August Bank Holiday were not disappointed as the club committee and sponsors Mc&S Agrisales Ltd and New Holland, had prepared a very special day indeed. The day started early with ploughs, harrows and tilling at midday followed by the teams of horses mowing, binding and drawing sheaves in the traditional harvest section. 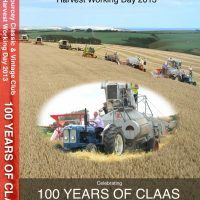 The vintage Claas, M.F’s Dronningberg, and Dania harvesters then started their own display. The official opening was then performed by Mr Andrew Watson C.E.O. of New Holland UK and Ireland, who had travelled to Ireland especially for the event. A new attraction this year was a huge ploughing area. Donal McCarthy’s team of Clydesdale horses were joined by a range of Ford and New Holland tractors from Keith Byran’s 1918 model F, to Jim O’Regan’s 2014 T7.260, to give an unforgettable display of ploughing. The final sequence in the ploughing area was a spectacular line up of the 24 participants in a single line spanning 96 years of progress. The Claeys, Claysons and New Holland combines were aligned for a unique formation harvesting display of 16 combines with Kinsale Harbour and the sea in the distance behind them. The earliest machine on site was a 1963 Claeys M103 owned by Michael Ryan, Ballinscarthy and the most modern was a 2014 New Holland CX6090 owned by Leonard Draper of Dunmanway. New Holland combines from each decade in between were present. As all this activity was taking place visitors were able take a break in the picnic area at the food village which occupied a central location in the 35 Acre field. Delicious food was served all day by local West Cork food outlets and many people returned several times to try out the different wares. The De Courcey tea tent was an especially busy place with many exhibitors and visitors having a cuppa and catching up with acquaintances for a chat. In tune with the harvest theme, there was an impressive display of various milling machines from horse operated threshing machines to engine and tractor driven mills. Raymond White from Ballinspittle was kept busy all day demonstrating how the hand operated kern stones produced flour from wheat. A fine display of vintage cars, trucks and tractors was on site. The tractors were of course dominated by the blue of the Fords. Many early Fordsons were also present. 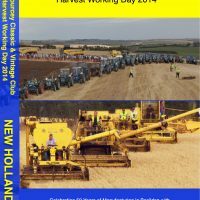 New Holland had a full range of modern machines at the event and the merchandise shop did tremendous business out all day. After the final harvesting displays completed the raffle was held. Prizes included three months use of a New Holland Tractor, a weekend break and a New Holland gift pack. Mr Andrew Watson was then called to cut a specially commissioned cake commemorating 50 years of tractor production at the Basildon UK plant. De Courcey Classic and Vintage Club would like to thank the members, sponsors, landowner, local groups and individuals and the many people who contributed in all sorts of ways for their support in 2014. 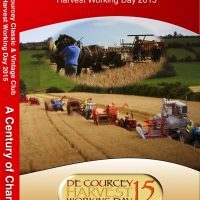 The presentation night also marked the launch of the official Harvest Working Day DVD produced by Kevin O’Neill. The hour long DVD is available from Kevin Tel; 087 7752059 or kevinoneill@gmail.com. Next year’s event is already being discussed. A new site on the farm of Paddy and Ann McCarthy close to Ballinadee Village has been selected. The club is looking forward to another successful Harvest day in 2015. This entry was posted in New Holland, News and tagged 2014, Ballinadee, Ballinspittle, Classic, Courcey, De, DVD, Harvest, marymount, National, New Holland, School, Underage GAA, Video, Vintage, Working on November 17, 2014 by admin.